Documentary videographer Peter Sinclair shares2016 climate change research. Sinclair recently returned from his fourth expedition to the Greenland ice cap, and brings his findings and insights. Sinclair is the Michigan based creator of the YouTube series "This in Not Cool" and "Climate Denial Crock of the Week". He is also the Media Director of the Dark Snow Project. Sinclair has been acclaimed as "...the most important videographer on the planet." His brand new, highly original, 2016 documentary presentation "This Is Not Cool" answers questions on climate change and climate solutions. The free event began at 7:00 p.m. on Wednesday, October 5, 2016 in Grand Rapids at the Fountain Street Church, 24 Fountain Street St NE. Doors opened at 6:00 p.m. Seating is first come, first seated. Ninety-one attendees were present. The event was co-sponsored by Local Future , the Sierra Club Greater Grand Rapids Group, the Citizens' Climate Lobby Grand Rapids and the Fountain Street Church Social Action Committee. 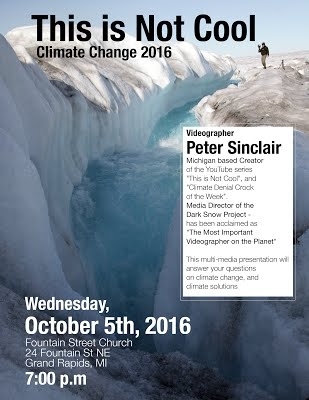 Video of Peter Sinclair's Climate Change Presentation Ninety-one people participated in this special event featuring climate presenter Peter Sinclair on Wednesday, October 6, 2016 at the Fountain Street Church in Grand Rapids, Michigan, USA. Local Future is a tax exempt 501(c)(3) nonprofit educational organization which is not affiliated with any religion, political party, or any other organization. Local Future is incorporated in Michigan.